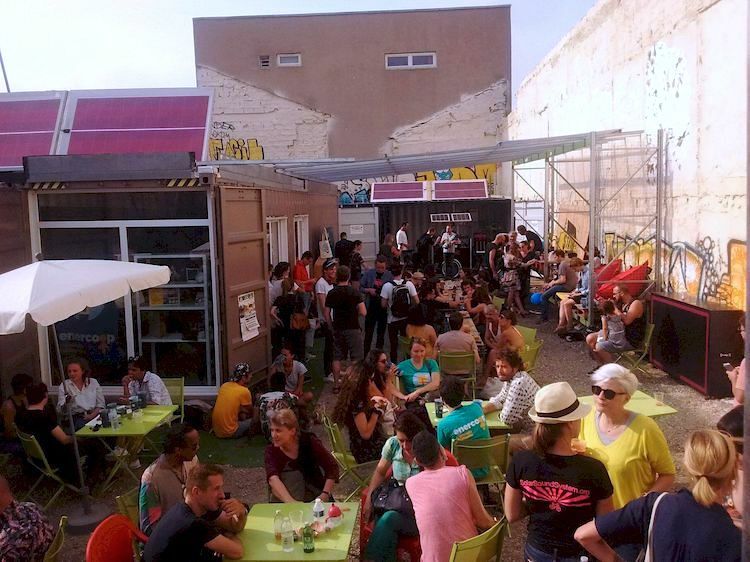 Beginning March 21 with a 20-hour livestream on Radio 3S and a party at Station E in Montreuil, Solar Sound System has a series of events lined up this year to celebrate its 20 years of existence. 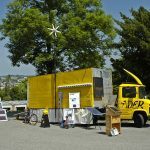 In part 1 of our interview, Cédric Carles talked about the first years of Solar Sound System in Lausanne and participating in the European EDEN (EDucation about ENergy) program between Switzerland and France, which he coordinated for ADER (Association for the Development of Renewable Energies) in the mid-2000s. 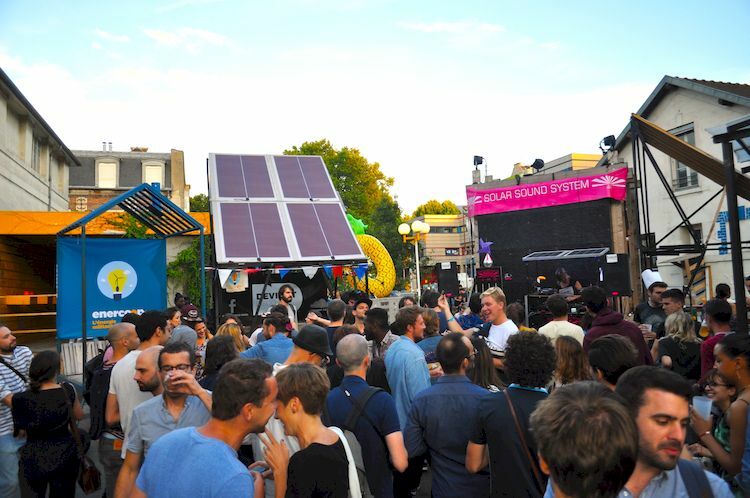 In part 2, he describes how Solar Sound Systems have proliferated around the world, research with Atelier 21, and the adventures of the Paris-based Solar Sound System at Grands Voisins and Station E in Montreuil. As coordinator, are you the engine driving the movement? Yes, but a Sound System doesn’t just come from one person, it’s a collective energy and dynamic, so we encourage each other, we stick with the teams involved. And it’s thanks to all the people whom we’ve met along the way that the project has lasted through these past 20 years. Before the EDEN years, for example, we presented the project at the Saint-Etienne Design Biennale, spontaneously sound-hacking in the exhibition hall with Tony Light and the team behind Snug Shop. We’ll also collaborate with Matt Black of Cold Cut, the founder of Ninja Tune, do a few more more Techno Parades, Nuits Sonores, etc. 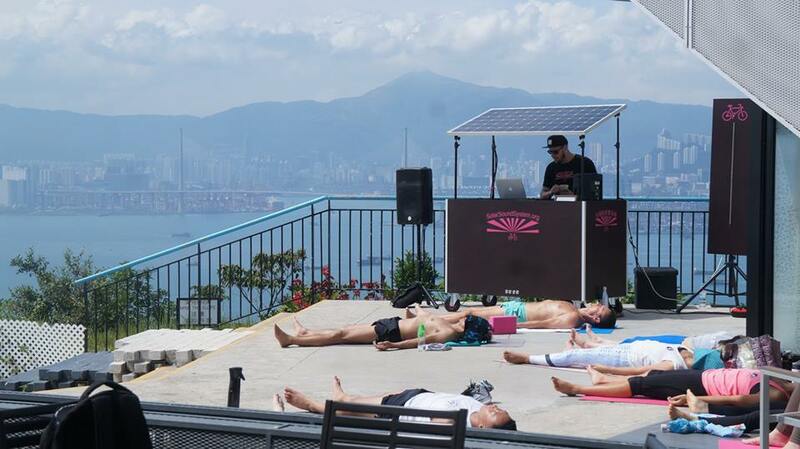 Solar Sound System is truly serendipitous. 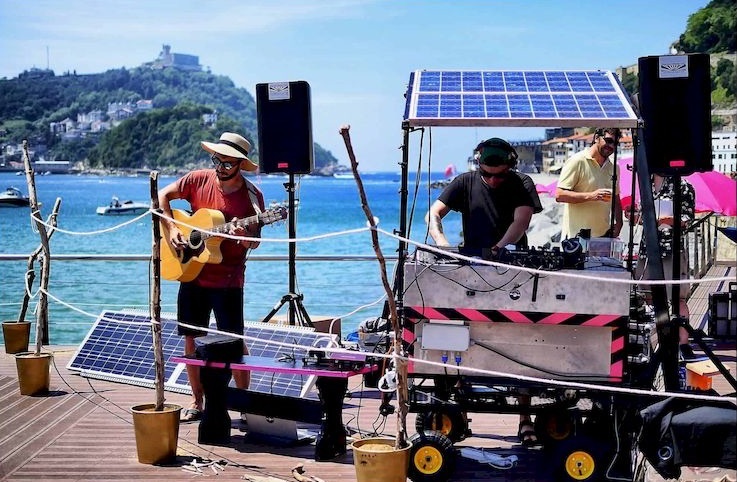 For example, around 2011 I met Rubens Ben, a DJ, photographer, digital nomad, at a Solar event along the banks of the Loire—a little festival of eco-friendly boats on the river, as we like to bring the System out to riverside music cafés. It was Rubens who set up an antenna in Tel-Aviv. 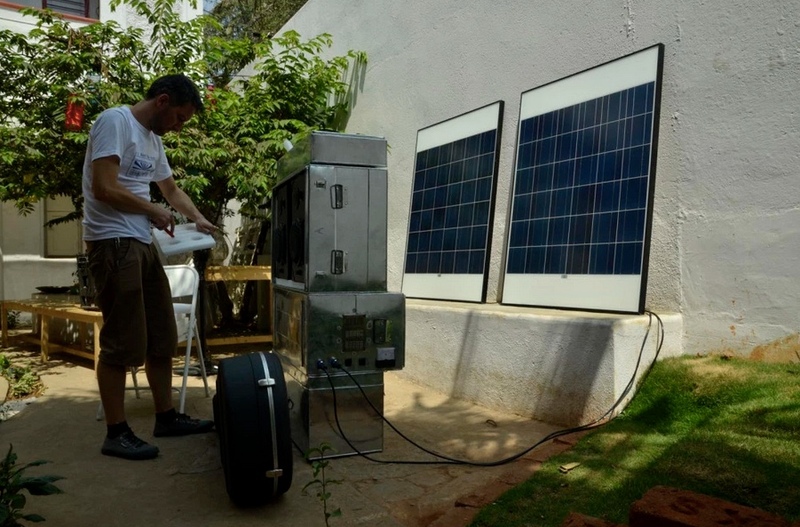 It was also during this period that we started a project in Bangalore, India, with the Vialka team, who had already worked with us in Lausanne and actively promoted Solar projects. This became “Rock the Sun” with the Jaaga organization, which works in Bangalore on inclusiveness and temporary architecture, mixing spaces with hackers, makers, artists, etc. We noticed that they were having regular power outages, which was a problem for the local geeks and coders, so we designed a system for them that uses a UPS (Uninterruptible Power Supply). It was stored at Jaaga, but the whole set-up could also be transported in boxes by just two people. The project is still ongoing (blog and making-of video). How did you comme to set up Atelier 21 in Paris? When I came back from Bangalore, Solar Sound System in Paris was hosted in Choisy-le-Roy by Bilum, a company that recycles tarpaulins, life jackets, boat sails, etc., to make accessories. They have a pretty cool circular-economy approach. It was there that I met Thomas Ortiz, who studied both art and material engineering in Grenoble, who plays music with his brother Lucas Ortiz as Les Frères. (Now Lucas is officially part of the band Ovhal 44.) Thomas and I first worked together on recycling a 5×5-meter tarp that I had brought back from the Solar tour in India, and since we hit it off, we decided to continue collaborating. So Thomas and Rubens and I launched the nonprofit Atelier 21 in order to expand our activities, do research projects on fuel poverty, work on Smart Grids at Cité du Design, develop the Paleo-Energetic research project, which led to a kit for reusing alkaline batteries with RegenBox, an old patent that has fallen into the public domain. 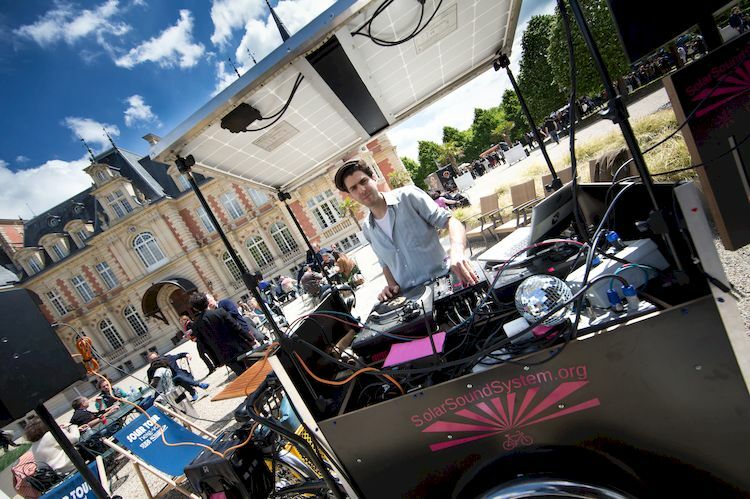 Thomas Ortiz with Solar Sound System at Chantilly Castle in 2017. With our limited means, we try to get sponsors for the various iterations, help them co-fund and build their own local Sound System. If it makes a profit, we encourage the members of the network to put some money back in to maintain Radio 3S and our tech developments on the Solars, support the research. The radio was launched three years ago—hosted with solar energy, of course. The concept is that access is shared among all the antenna, and anyone can post mixes, track lists, take over and do a livestream, etc. It’s also seen as good visibility for labels that want to broadcast on our transnational radio waves, as well as potentially on the other Sound Systems of the network. Solar Sound System, Basque Country antenna, in San Sebastian, Spain. 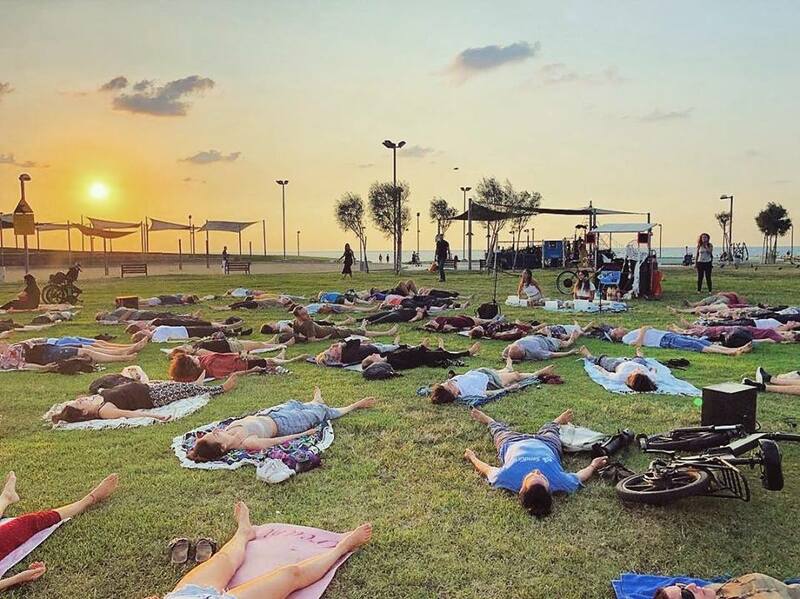 Solar Sunset Session, Charles Chlore Park, Tel Aviv, photographer unknown. And in 2015 you came to Grands Voisins? Yes, we left Bilum to settle in the first version of the Grands Voisins project. This gave us more visibility in Paris, and in this sense it became possible to develop other antenna thanks to sponsors who encountered us through this experience. 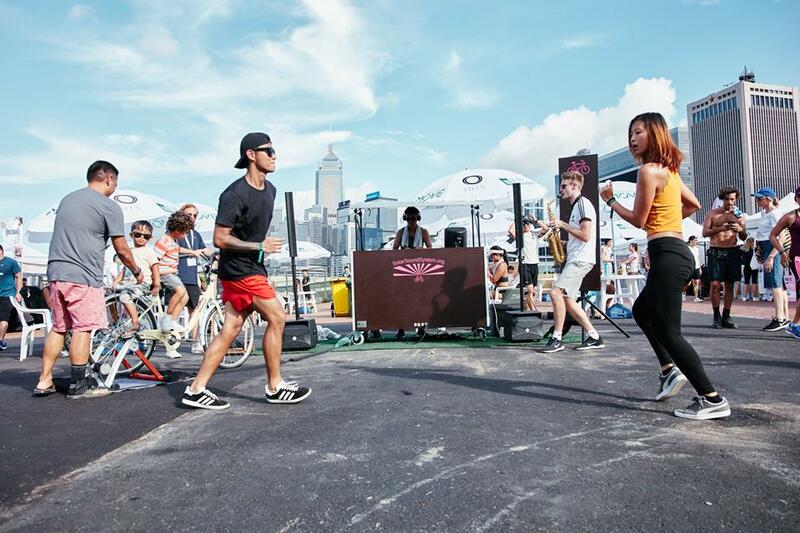 The Schneider Electric Foundation, which supported Solar Sound System in Hong Kong, supports radio and regularly collaborates with us on the Paleo-Energetic project to exhibit the history of innovation in fuel energy. Enercoop also supports our Solar Disco events, for example. And times have changed. Up until now, we always wanted to operate autonomously, but since we started there has been Fukushima, COP21… We are no longer categorized pejoratively as alt-eco-warriors for whom the planet is doomed. So now we can better convey our message, find intelligent partners who understand us, go pretty far, show sustainable lifestyles, do research, all while continuing to mobilize communities and stimulate fruitful encounters through the Sound System. In this sense, these past years and Grands Voisins have been a transformative experience. When we learned that Grands Voisins was going to slim down, we responded to a call for projects by Est Ensemble for occupying empty lots. We applied for a lot at 236 rue de Paris in Montreuil. The lot itself has nothing—no electricity, no running water. We proposed to install our solar system inside containers, our dynamos and bicycles, phyto purification. We were chosen, so we named the site Station-E—E for Energy, an irony on the start-up nation perhaps, maybe also E for Effondrement (collapse). 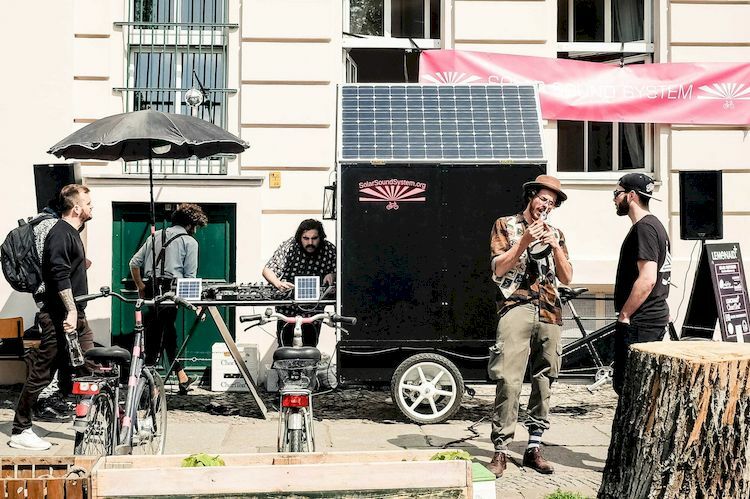 One year ago, we considered putting the Berlin Solar Sound System inside an autonomous container called Energy Station next to Tempelhof airport, where we would be off-the-grid. This was in line with our mission, as ever since we got involved with Paleo-Energetic, we’re constantly digging up old patents. There are too many things that have been forgotten, energy systems that have disappeared, because they weren’t necessarily efficient enough for their time, or not “scalable”, after the wars, during the oil crisis, etc. It’s amazing what you find in the fields of co-generation, wind energy, solar heat, electric vehicles, hybrids, using low-tech bits that sometimes date back as early as the 18th century. Our book Rétrofutur, which we authored collectively, illustrates this research. All this led to working on typologies of research topics. For example, the Bouygues Telecom Foundation supported us to work on the crucial focus of storing renewable energy. As renewable energy is intermittent, it’s important to have buffer stocks that we can redistribute when we really need them. If we had the power of an institution, we would go searching even more systematically through the archives. We interact with schools and a network of volunteers, we also publish missions for academics. 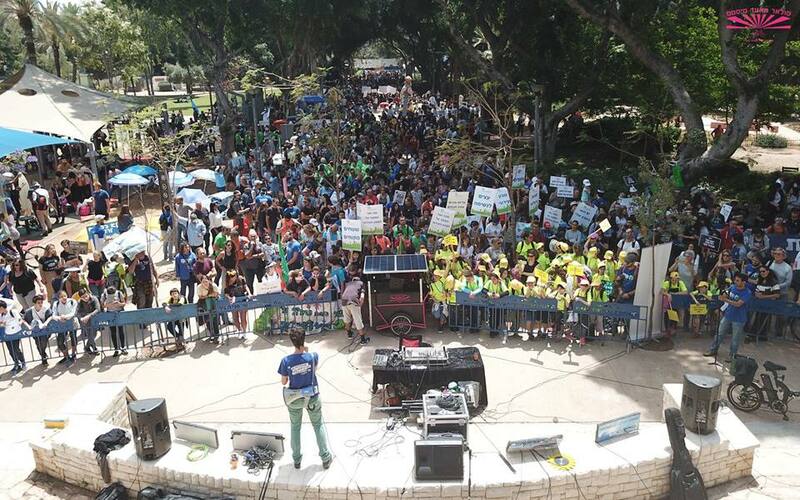 We believe that renewable energy should be taught in school, as a transdisciplinary subject. Energy is the blood of our societies, and with Peak Oil, our societies have entered a recession. We need to learn how to avoid or manage our dependence on fuels, to think resilience. And there are certainly leads to follow with addictologists, yet another field of research that we are eager to explore! So Station E is a prototype of a resilient micro-system? Yes, Station-E is actually a place in the city where you can come to listen to music, charge your phone or other electronic devices, learn about energy, have light, all on an autonomous system in case of blackout and powered by green electrons from Enercoop. In urban areas that are connected to the grid, it would be an aberration to say that we need to use batteries. The self-sufficient blue container Energy Station, however, is the prototype of a system that we imagined a bit after the disaster in the Philippines, and then for Berlin, which consists of a secure container that is resistant to very strong storms, uses a UPS system, with wifi, some telecom, a space with speakers to broadcast music, educational material, emergency messages, village announcements, in complete autonomy, in case the remaining energy infrastructures all collapse. Like a rescue group in case of trouble, it may seem exaggerated to us, but there are many places where it would be absolutely relevant. How will you celebrate your 20th anniversary? 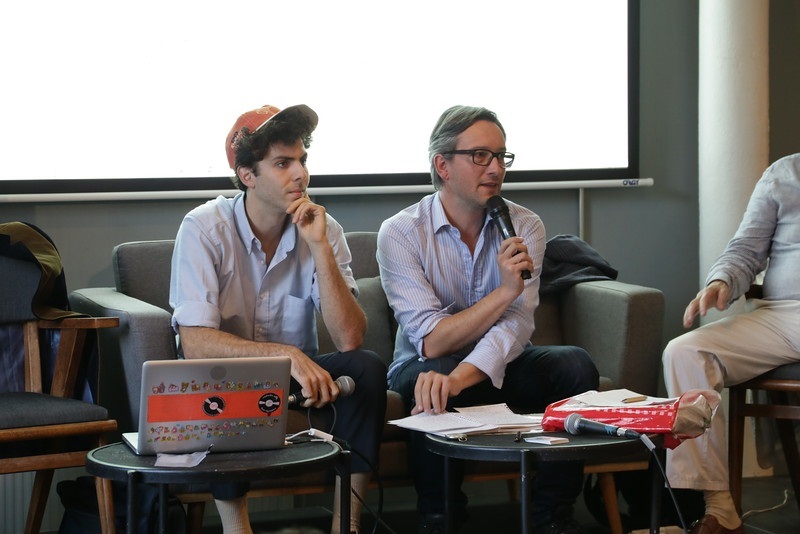 We’re organizing a lot of events this year, beginning on March 21 with the 20-hour radio livestream, starting in Hong Kong, then Tel-Aviv, Paris, etc. We’ll open the station on March 21, from 10am through the evening, also to announce a new season. On May 18, we’re participating in the Observatoire du partage festival. We want to do stuff around sharing knowledge, based on vital needs—water, energy, food—and we’ll host La Caravane supermarket co-op, a seed bar, as well as a series of talks about sharing knowledge to build resilience, DIY agriculture. And because collapse is a real issue these days, we’ll organize discussions about concrete solutions on how to react. We’ll also have a festive week to celebrate our 20 years, with the physical presence of the teams from Lausanne, Basque Country, as many as possible who built the Solar network. 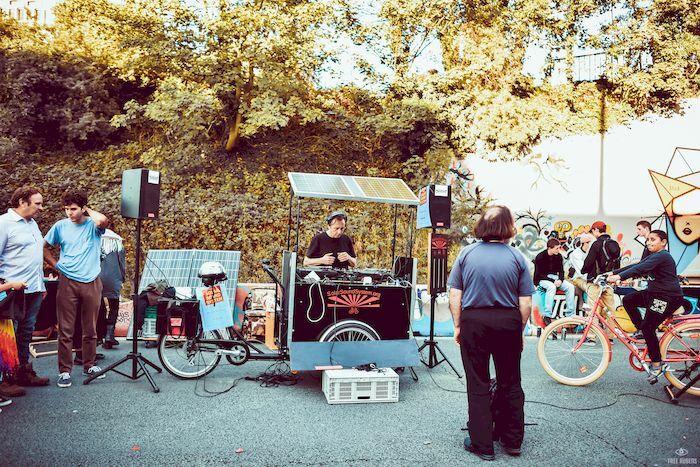 There has never been so much collective energy around Solar Sound System, and we want to share it. This interview is dedicated to Yoshi Hitchcock (Deviant Disco).